This exciting keynote address inspired a unique evening celebrating the courage of Greek, Greek-Americans and Phil-Hellenes from the 1821 Greek Revolution to the Iraq War. The militaristic Cretan dances, by Labrys Dance Group of the Omonoia Cretan Society, thrilled the audience. The evening concluded with Greek cuisine donated by parents and local merchants. This event was a joint effort of the Modern Greek Language and Literature Program of St. Johnʼs University, the SJU Greek Club and Omonoia Cretan Society. The student moderators were Haritomeni Scoufaras, Theodora Christodoulou, Marina Filippatos and Diamanto Ktenas. Technical support was by Takis Kokkinos. Photography was donated by Chris Freda and Markos Papadatos. Prominent persons present included: Dr. Gaetano Cipolla; Dr. Florence Russo; Lt. Col Andrew Lyons, Jr., Associate Director of the University Freshman Center; ROTC Major Leonard Sloat; Robert A. Pennacchio, Associate Director of St. Johnʼs University Honors Program; Dean Ekaterini Georgiades of St. Johnʼs College; Karl Rutter of the Global Studies Department; Dr. John Nathenas of DIAS International Academic College Program; Alex Doulis and Stavros Haviaras of the Chian Federation, Nancy Biska, international journalist/webmaster and others. The opening prayer was performed by Very Rev. Robert Stefanopoulos, SJU Professor of Theology. The SJU ROTC unit presented the American Flag. Major Leonard Sloat awarded scholarships in memory of the late Staff Sergeant George V. Tsounis, POW W.W. II hero and the late George Aneson (Anastaselis), engineer hero of the Remagen Bridge, Germany. TAPS was played by pugilist Robert A. Pennachio, SJU Honors Program Director. “Tonight we give the Final Salute to two men who saved the lives of their fellow soldiers, regardless of their own safety,” said Major Sloat. The following students were given scholarships dedicated to the remembrance of the late George V. Tsounis: Jacqueline Burns, the George V. Tsounis Scholarship donated by Dr. John G. Siolas and Gerasimos Grigoratos; Michael Hefferon, George Aneson Family Scholarship by Mrs. Fotine Aneson, Kostas Marathounas and Mrs. Kathi Hatzi and Jorge Pocasangre and “In Memory of Philip Halikiopoulos”, by Mary Halikiopoulos. Stephen Cherpelis, international philanthropist and Dikaiophylax Archon of the Patriarchate of Constantinople aided in the creation of the first scholarships in 2000 for excellence in Modern Greek. He has continued aiding the program in the background. The 2008 Stephen Cherpelis Scholarship was presented to Christopher Freda. 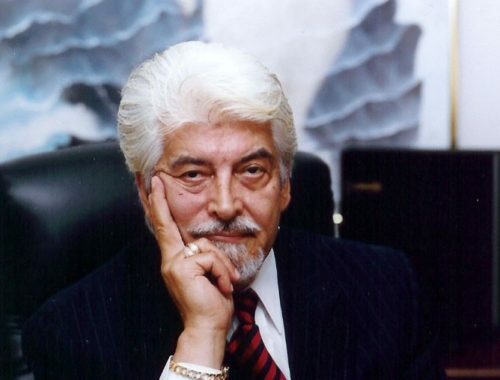 The Chian Federation in 2002, under the leadership of former President Alex Doulis and businessman Mr. Scoufaras, began generously donating scholarships. Students Niki Tsismenakis and Marino Kambourakis were presented with scholarships by Stavros Haviaras, Executive Vice president and Alex Doulis, 4th Vice President of the Chian Federation of America. The first “In Memory of Dr. Panagiotis Kokolis Scholarship” was presented to Haritomeni Scoufaras by Nancy Biska, journalist/webmaster. Since 2000, the Greek-American community has donated over $95,000 in scholarships that has been awarded directly to outstanding students. The high point of the evening were the internationally recognized Labrys Dance Group of the Omonoia Society under the direction of dance instructor Mr. Nick Zoulakis and Jimmy Bobolakis. Cretan dances are centuries old, passed from generation to generation. They tell of the spirit, bravery and passion of the Cretan people. The Cretan waged 350 revolution during 200 years of Turkish occupation from about 1700-1900. Many of the dances, such as the Pentozali, is a war preparation dance. Dr. Christoforos Charalambakis, an outstanding linguistics professor of the University of Athens and European Union, is working at the Academy of Athens on a new Greek dictionary modeled after the best English editions. “Our dictionary will have examples on how to use words,” he said. Cretan culture is very much alive on the university scene through the work of linguists such as Dr. Charalambakis.